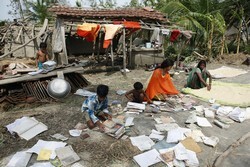 Cyclone Aila, the latest in the line of natural disasters to hit South-East Asia, tore through parts of coastal Bangladesh and South eastern India on May 25th, killing over 200 people and leaving 500,000 people homless. Persistent heavy rain has triggered further landslides and burst mud embankments, threatening to increase the death toll. Muslim Aid emergency teams were on the ground well before the cyclone hit, evacuating people and moving them to secure cyclone shelters. Needs assessment will be carried out in Satkhira, Bagerhat, Patuakhali, Barguna and Pirojour, while emergency teams have already reached the worst hit areas with water purification units and 500,000 water purification tablets. Muslim Aid teams are also distributing food parcels to people in remote areas. Head of Emergency Programmes at Muslim Aid, Anamul Haque said, “The priority now is getting clean water to the survivors of the storm, as hundreds of water sources and wells have been contaminated. Funds are urgently needed to provide emergency relief so we can continue to provide help wherever needed”.